Josh Allen had an out-of-nowhere successful season for fantasy purposes as a 2018 rookie in Buffalo. He was QB21 on the season, which looks even better if you break it down to points per game (18th) and looks even better-better if you look at his performance from Week 12 on after he came back from injury (first, 25 points ahead of third). The problem for the Bills, though, was that his production in many ways was far more impressive for fantasy than it was for real football. Allen averaged only 6.5 yards per attempt. He had 10 touchdown passes against 12 interceptions. He had a 67.9 passer rating and a 58.0 PFF passing grade (33rd of 39 qualified quarterbacks). He had the worst collection of weapons around the league, which couldn’t have helped matters, but as a passer, Allen still has work to do. This offseason, Buffalo needs to rebuild its offense to help see if the raw quarterback can become a real difference-maker rather than just an impressive specimen with surprising rushing ability. The team’s moves need to be based around that enterprise. We said in our offseason wish list that the ideal-for-fantasy landing spot for Bell is with the Jets, and while that’s true, a signing in Buffalo would be very interesting as well. Adding Bell to the backfield would likely mean jettisoning the past-his-prime LeSean McCoy, but that’s a tradeoff you make 40 times out of 30. Bell is a, well, bell-cow back who has gotten usage we haven’t seen much in recent years. For a team that needs everything on offense, adding one primary piece can be a safe shorthand. If Bell wants to play in Buffalo, he can be the focal point of an entire offense right away and help a developing quarterback find his footing. 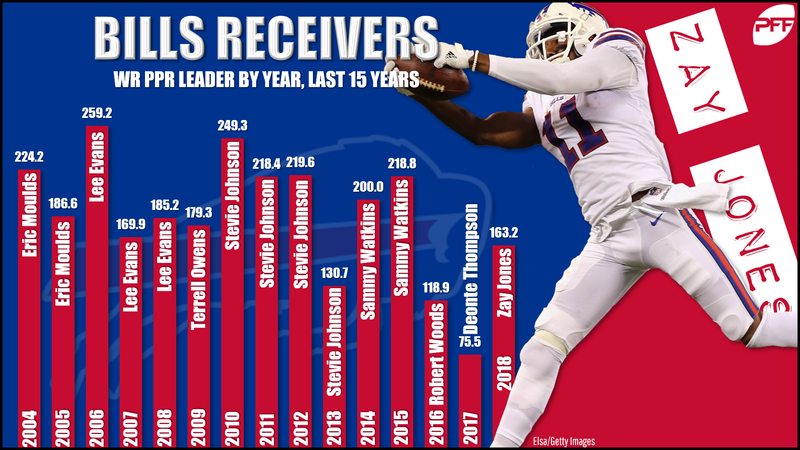 The Bills have had a miserable receiver situation for at least the last three years, and if you want to stretch it, you could argue it’s been bad since Stevie Johnson’s heyday in 2012. Zay Jones finished 35th among receivers in PPR scoring in 2018 and that’s easily the best a Bills receiver has finished since Sammy Watkins in 2015. So adding just one receiver to this group isn’t nearly enough. The Bills should bring in the veteran Tate to be the slot presence the team lacks, and coax Hogan into a Buffalo return after his New England tenure could most generously be described as “middling.” Adding those two to the developing Jones and the 2018 rookie surprise Robert Foster would give Buffalo the best top-to-bottom receiving corps they’ve had in … ever? Rodger Saffold is the immediate name that comes to mind for the third-in-cap-space Bills, but then Saffold is going to be the name that comes to mind for every franchise this offseason. Ty Nsekhe, Ja’Wuan James, multiple draft picks … wherever the Bills can get some help to improve their 31st-in-the-league run-blocking grade of 47.3, they should. Whether the team has Bell, McCoy or some other running back in the backfield to start the year, better run-blocking will be crucial.